To honor my client’s wish to stay anonymous, I’m going to call her the “super mom” in this blog entry. She is a mom of 3 amazing kids, and a wife to a hardworking husband. They moved their whole family to another country when her husband got a work opportunity abroad. This super mom believes that setting a good example is an important part of raising her children. And surely, she was able to fulfill this from the start. She showed them how family tops everything in one’s priorities. Even though she’s a licensed doctor, she chose to take a back seat in her career so she can focus on nurturing her family, especially since they live abroad and away from their extended family. She also showed her kids that it’s never too late to learn new things and achieve whatever it is they want to achieve. Now that her kids are older, she pursued a new course and got her certification on health and wellness coaching. She even started her own company now! A super mom, indeed! When she learned of my visit, she asked me to help her declutter and organize her walk-in closet. Now that she’s starting a new journey as a working mom, she wanted to cleanup her wardrobe so she can make space for her new lifestyle and make her morning routine as easy and stress-free as possible. We only have a half day to organize her walk-in closet and it was a relief when I saw that her closet has a certain level of organization system to it already. She has designated drawers and cabinets for each type of her clothing. All we needed to do was to edit her clothing items, and put in effective storing techniques to maximize her storage space and keep her closet organized long term. Here are some tips from this decluttering project, which you can follow too! 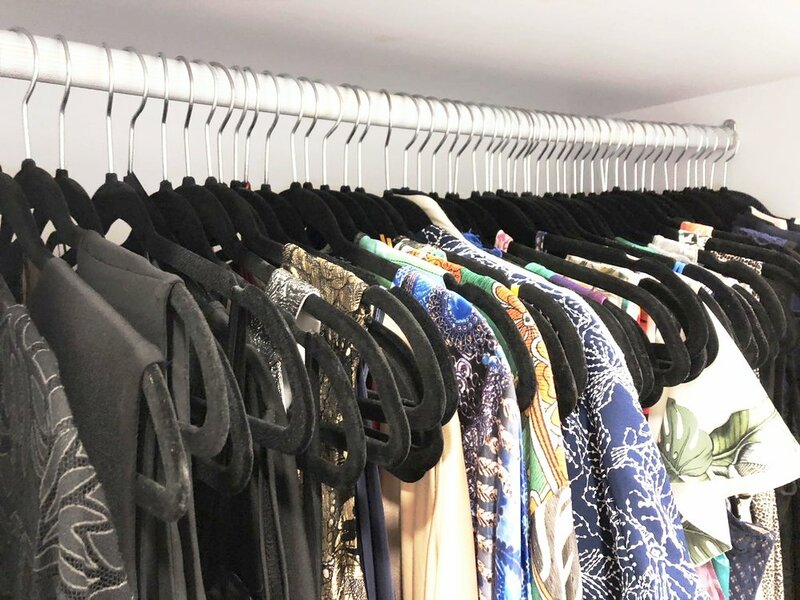 This super mom acknowledged that her closet was filled with clothes accumulated over the years, which made it difficult for her to organize and see everything. She also understood that the current state of her closet does not make her feel supported and relaxed especially now that she’s juggling motherhood with a new career. 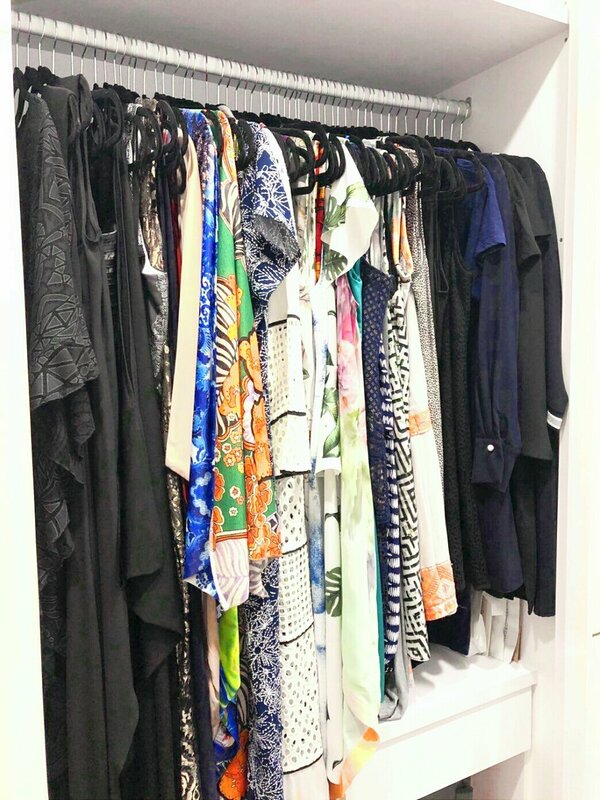 She envisioned a neatly organized closet so she can feel energized and joyful when she starts and ends her day. Having a clear idea of your current situation and ideal future help in motivating you to carry on with the daunting task of decluttering. I know many people, and not just moms who has the intention to declutter and organize their spaces but just cannot find the time or energy to do it. This super mom has been wanting to organize her closet for a long time but has been postponing it. When she knew about my passion project and my visit, she decided to ask for help so she can have an extra pair of hands and hold her accountable in getting the job done. So don’t be afraid to ask for help from a professional or even a friend! Decluttering is much easier when done with a company! Just like any other storage spaces, our closets are usually left neglected due to our busy schedules and life priorities. Clothing items get mixed up and ill-fitting and outdated clothes left buried in the depths of shelves. When decluttering, make sure to take out everything and sort per category. Sorting is the key in giving us a better idea of what we have too much of and thus make the process of letting go much easier. Sorting also helps us in planning how and where to store our clothing items after! File folding - this type of folding works best as it allows you to fit more items into a drawer or container, while keeping everything seen and easily accessible! See how we file folded her undergarments! 2. Choice of hangers - choose slim velvet or plastic hangers to maximize your hanging space. Stick to one color only to keep everything coordinated. This is the ultimate goal of decluttering. We let go of things that no longer serve us so we can create space for those that do. In the case of this super mom, her eyes glow whenever she sees her beloved bags, as each has a beautiful memory and story behind. So she was determined to let go of excess clothing so we can make use of additional shelves as a home for her precious bags. After our decluttering session, this super mom proudly showed her now organized and spacious closet to her family members and said “they can breathe now”. I’m happy that she found a renewed joy in her closet, just as how she found a renewed passion in her new journey as a working mom! So for all the super moms out there, I salute you! Whatever journey you’re in, I hope that you feel loved, supported and appreciated because YOU ARE SPECIAL simply for being a mother! I hope you learned a thing or two in this decluttering project and be inspired by the following before and after photos!